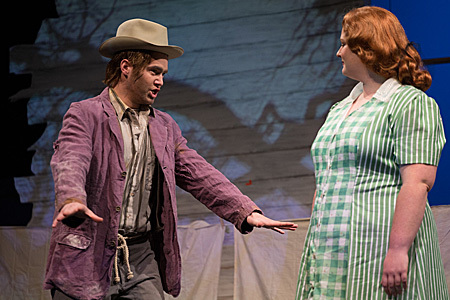 American composer Aaron Copland‘s classic folk opera “The Tender Land” comes to the stage of Stansbury Theatre Feb. 19-22 in a collaborative production of Lawrence University’s theatre, music and opera studies programs. Curtain times for performances Feb. 19-20-21 are 7:30 p.m. with a Sunday, Feb. 22 matinee at 3 p.m. Tickets, at $15 for adults and $8 for seniors and students, are available through the Lawrence University Box Office, 920-832-6749. The three-act performance runs approximately two hours with no intermission. Well known for its soaring melodies, “The Tender Land” brings the Depression-era American Midwest to life. With Copland’s music and a libretto written by his romantic partner Erik Johns under the pseudonym Horace Everett, the story explores themes of the stranger among us and the stranger within. Under Copland’s sweeping, yet intimate score, characters dance between their own inner and outer worlds. The story is told through the eyes of Laurie Moss, the eldest daughter of a Dust Bowl-era 1930s farming family, who feels unconnected to both her family and community. The arrival of two drifters turns Laurie’s thoughts to the freedom of the road and its possibilities. Smitten with one drifter, she plans to leave home with him, only to have him depart without her. Laurie soon realizes it was the dream of abandoning the farm and starting life on her own terms with which she was really in love, not the drifter. The production is the Lawrence debut of award-winning opera director Copeland Woodruff, who was appointed the college’s first director of opera studies last spring. He joined the faculty in September. In November, Woodruff earned first-place honors in the prestigious National Opera Association’s Best Opera Production Competition for the fifth time in the past eight years. He was recognized for his 2014 production of Mozart’s “Così fan tutte” with University of Memphis Opera. The set incorporates the use of a large, opaque, translucent quilt, which serves as a surface for projections. Other elements of the set are skeletal/suggestive that function in different ways, including as projection surfaces. The opera will be performed with a split cast, with seniors Graycie Gardner and Stephanie Popik sharing the roles of Laurie Moss. Seniors Kirsten O’Donnell and Melina Jaharis sing the role of Ma Moss, while junior Charlie Aldrich and 2010 Lawrence graduate Justin Berkowitz portray drifter Martin, Laurie’s love interest. 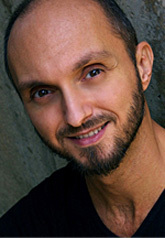 Dirk Durossette served as the production’s scenic designer. Barry Steele designed the lighting and projection while Karin Kopischke was the show’s costume designer. The orchestra will be led by guest conductor Katherine Kilburn with music direction by associate professor of music Bonnie Koestner. Prior to each performance, several area agencies who deal with marginalized and disenfranchised members of the Appleton and Lawrence communities will staff tables in the lobby of the Music-Drama Center to interacting with audience member as a way of setting a tone of how the stranger among us is perceived. Following each performance, there will be a talk-back sessions led by representatives of Celebrate Diversity Fox Cities with the audience to facilitate discussions on moving from an “us-them” paradigm to a more inclusive “us” mentality. “We hope to open up Lawrence’s doors to community members who well may have never been on our campus,” said Woodruff.